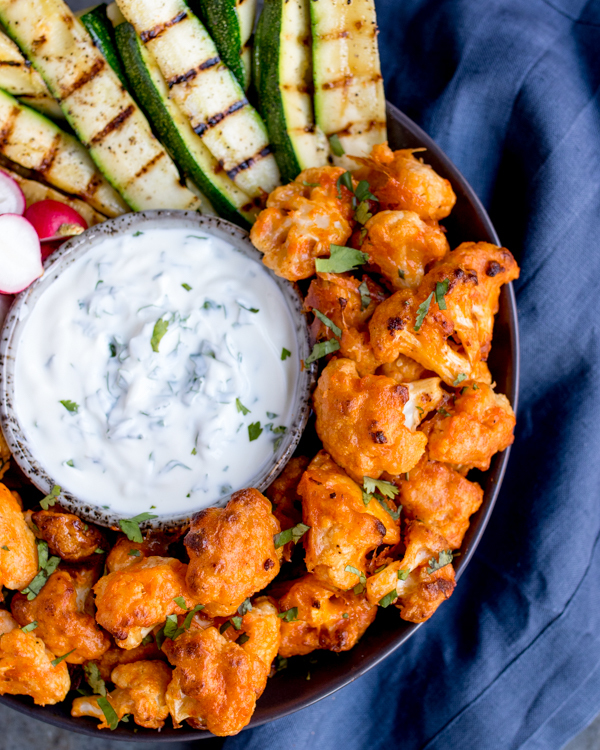 These Baked Buffalo Cauliflower Wings pack a real punch! Hot, spicy and totally moreish! How happy was I when I first saw American hot sauce in my local store in the UK? Secret happy dance in the aisle kind of happy! I love helping to create recipes for Ashley, and if they’re US-style recipes, so much the better. Whenever I come over to the US, I’m like a woman possessed, trying every different food I possibly can, and spending forever in the massive stores you guys have over there (trip to Florida booked in Summer – yay! I can’t decide if I’m more excited about Disneyworld or The Cheesecake Factory. I definitely have a problem!). The downside of living in the UK, is we miss out on so much! Graham crackers, Cool Whip, Samoa cookies, apple cider (we only have the alcohol version), Butterfingers, root beer – and that’s just for starters. 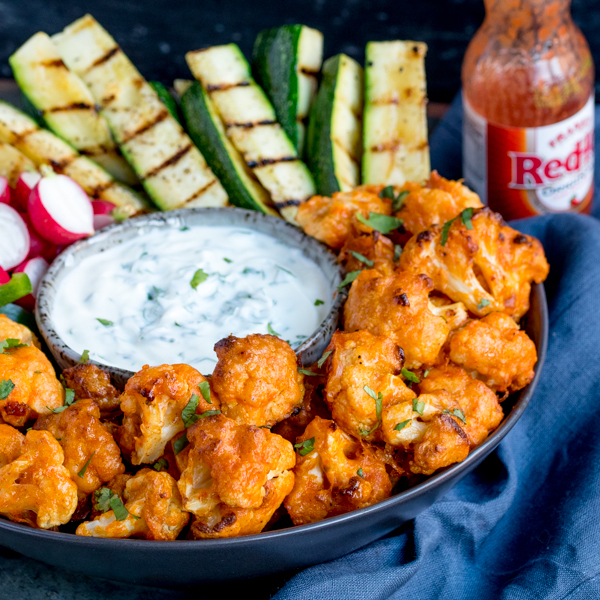 So when I finally spotted Franks hot sauce, I couldn’t wait to make these buffalo cauliflower wings! They’re crispy on the outside, tender in the middle and HOT! I served mine with fresh veggies, grilled zucchini fingers and a cooling dip made from natural yogurt, a little garlic and sugar and some fresh cilantro. Preheat the oven to 450F and line a large baking tray with a silicon mat or baking parchment. Cut the cauliflower into chunky florets and put to one side. Add the milk, water, flour, garlic salt, celery salt, paprika, salt and pepper to a large bowl. Mix it all together and add the cauliflower florets. Toss together to completely cover the florets, then use a slotted spoon to lift the florets out of the mixture. Place the florets on the prepared baking tray, leaving a little room between each (don’t just tip the bowl out, or you’ll end up with a pool of excess batter all over your tray). Place in the oven and cook for 20 minutes, turning once after 10 minutes. Melt the butter in a pan or the microwave and stir in the hot sauce. Remove the cauliflower from the oven and brush the hot sauce mixture all over the cauliflower. 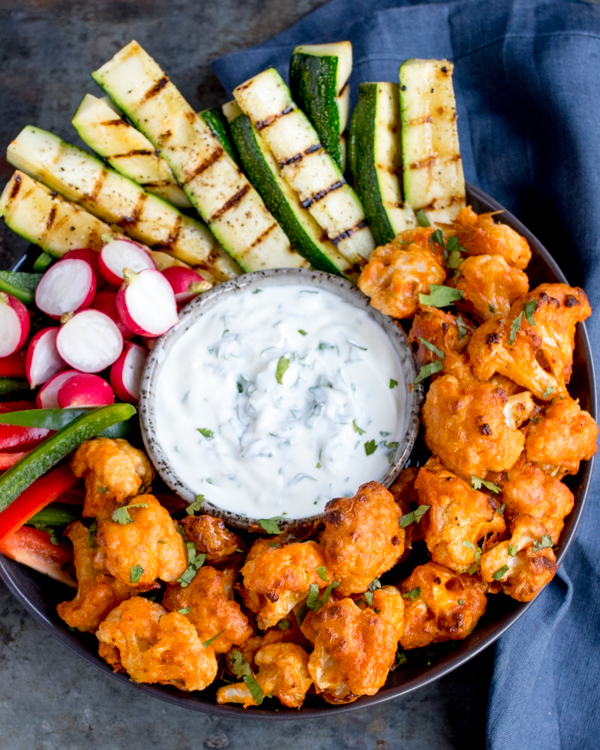 Turn the cauliflower over to get it completely covered in the sauce. Place back in the oven for 10-15 minutes until dark golden. Remove from the oven and serve with your favorite dip.